Factory Win and Rem load theirs to 710 fps. Must be a good reason. Winchester Match is excellent and the bullet doesn't wobble producing a semi keyhole in the target like others. A bit pricy, though. That being said, 2.7 gr. of WST behind a swaged 148 HBWC is considered "the load". Works great in my 52 and revolver. Starline small primer brass ? Who has the correct lead bullet ? The correct lead HBWC is Remington. Good luck finding those. You can get near factory accuracy using Magnus Swaged HBWC, Precision Delta HBWC or Zero swagedHBWc, as for loads, either 2.7 or 2.8 gr of either WST or Bullseye will work. You'll need a slight roll crimp just like the factory. As for factory, Remington, Winchester, and Federal are gold standards. Magtech, and Sellier & Bellot will do in a pinch. Fiocchi shoots well but doesn't function in my 52-2. I just looked at Magnus and did not see this style in swaged. Magnus 148gr hbwc shot 1.5" from my pistol. Excellent bullets. Just saying @ 25 yds. this is the bullet that everybody seeks. You are allowed to back order them at Midway right now. I have never seen that so they must be confident they will get the bullets in soon. I got some last month, first time I've ever seen them available anywhere online. Good results can be had with either, but your 52 will probably prefer a slight roll for feeding purposes. Look at factory ammo and duplicate that style and amount of crimp. HBWC swaged bullets don't like too much crimp and I've never used a "Factory Crimp" die. Just a slight roll as I finish seating the bullet. Totally agree on the Redding die.. WST is hard to beat in the special. HBWC or DR ammo. Got it guys, Thanks again. 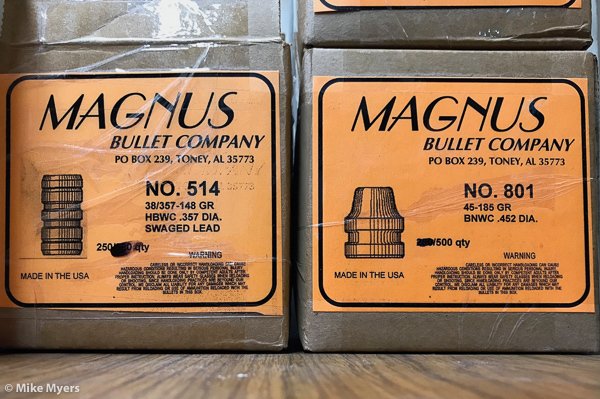 From what I have heard that the Remington 148 grain 38 special bullets have been discontinued, they still list the loaded cartridges on the website but I have not seen too many sources for the loaded ammo that have it in stock. I have used the Precision delta bullets and they seem to shoot well. Remingtons are still being made. Friend just had a backorder of 6000 delivered. Nice to hear Jon, I am glad another good product is still available. Have a nice weekend. Jon Eulette wrote: Remingtons are still being made. Friend just had a backorder of 6000 delivered. From where were they backordered ? I just back ordered 2000 from Midway. those will make you very happy..
+1 on Magnus Bullets. Plus, Bullseye-L forum members get a 15% discount.